News » With the Salvum application, play at saving lives ! Salvum is an e-learning tool published by the company Abeilles Multimédia. Designed as an educational game, it allows you to sit the theoretical part of the First Aid certificate by distance learning. The key to a real diploma validated by healthcare professionals. The software has already been awarded several prizes. On the 8th of December , Pierre Sabin, founding partner of the company Abeilles Multimédia, took to the podium with a shy smile and light heart, before an audience of local business leaders. For the second time in a week, his Salvum project had just been recognized by his peers: the juries of Seine-et-Marne Development and the Chamber of Commerce respectively awarded him the prize for creativity in the Innovation category in Seine-et -Marne and 3rd prize in Digital Challenges in 2014. Before being released, Salvum was attracting attention. But what makes this game so special ? 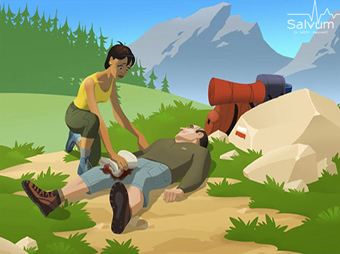 Easy to use, Salvum is playable from 10 years and up, regardless of your level of knowledge of first aid. It is played on a computer, smartphone or tablet. First of all, the game tests your level .It then proposes a series of 200 cases (500 in total) that you validate at your own pace. In each case, you must save two victims in each neighborhood with each situation corresponding to an elementary notion of the training. Since July 2012, the law allows for part of the training to be done through distance learning. With four partners in civil security, Abeilles Multimédia was able to raise the funds to create the application and health professionals validated it. And where does education come in ? Knowing that Salvum targets both individuals as well as business or college students, the educational aspect remains essential. “The algorithm we developed adapts to each individual,” explains Pierre Sabin. This is where his colleague Mary intervenes: the company’s cognitive psychologist relies on the method used during our first years of life: learning by error. “From a cognitive point of view, we think first of all, sometimes we make a mistake, we analyze, then act.” “Relying on memory is much less effective” says Pierre Sabin. Around thirty first aid training modules exist. Salvum trains you for PSC1. “Salvum is the infrastructure that will generate other courses. The company can see what the future holds” assures the boss, with confidence. First aid certification could become compulsory for obtaining the driving license, from 2015. “This represents nearly 1 million people a year,” says Pierre Sabin. Other targets: secondary schools, training organizations and companies that want to reduce costs. A final, irrefutable argument (see image). Salvum is salvus *!